Who loves birthday parties? Me, I love birthday parties! 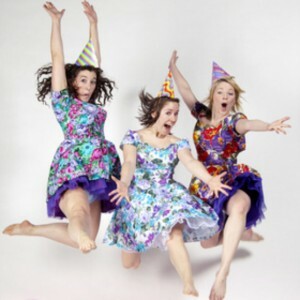 And I loved Dancing in my Unbirthday Suit by Inertia Productions, which is 30 minutes of colourful balloons, wrapping paper and party dresses. And loot bags for the audience. Whee! This show opens with a dancing birthday present, and takes us through about half a dozen vignettes that are silly, fun and show off some amazing dance technique. Allison Elizabeth Burns, Joannie Pharand and Vanessa Kneale make up the trio of female performers, and they’re all skilled and energetic. I love dance shows like this, and I’m glad the Fringe’s Dance Initiative is around to bring these shows to fringers. Even if you’re not traditionally a fan of dance, I urge you to check out Dancing in my Unbirthday Suit. I guarantee you will leave this show in a good mood.